Participants of the “Power-of-Knowledge” Presidential Forum (October 30-31) in Washington, D.C., gained a whole new appreciation of the Technion and its contributions to people around the globe. 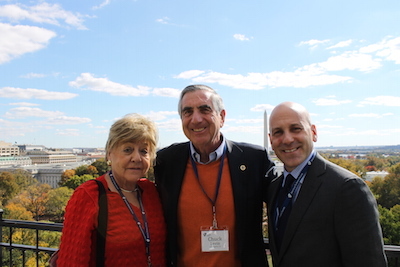 The experience, co-chaired by Laura Flug, Ed and Cyma Satell, and Mark Sheinkopf, gave direct access to newsmakers, politicians and Technion experts who presented a behind-the scenes look at the key issues we face today. The gathering also provided the opportunity to celebrate the impact of Technion support over the past 75 years, and a look ahead at an even more ambitious future. See a review of the exciting program below and click here to view the Presidential Forum photo album. On the eve of the Presidential Forum, Guardians gathered for a VIP event with two special guests: Ambassador Ronald Lauder, President of the World Jewish Congress, and Israel’s Ambassador to the United States Ron Dermer. 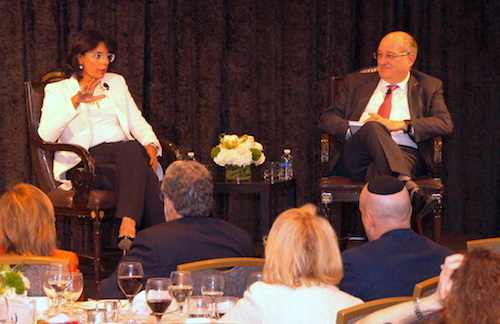 Both provided insight into the current state of affairs in the Israel/U.S. relationship. “When the world needs more water . . . better ways to irrigate its fields . . . new apps for its phones and computers, who does it look to?" Ambassador Lauder asked. Despite the growing BDS movement, the answer, of course, is Israel. “Countries that don’t know much about Israel . . . have nothing but admiration for the brilliant technology that comes from the Jewish State,” he said. 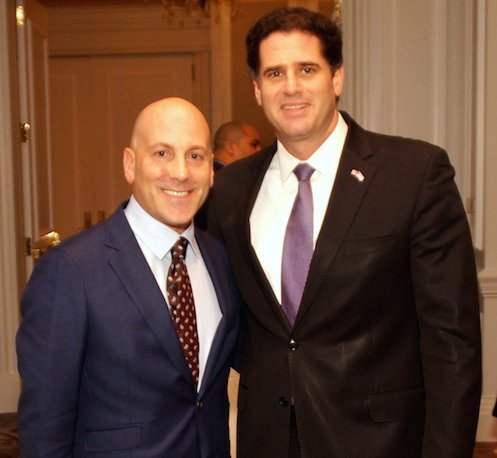 Ambassador Dermer spoke of the Technion’s role in creating what he calls the Innovation Nation. “The Secret to Israel’s success is chutzpah, which is the culture of questioning. The Culture of Innovation=Technion,” he said. 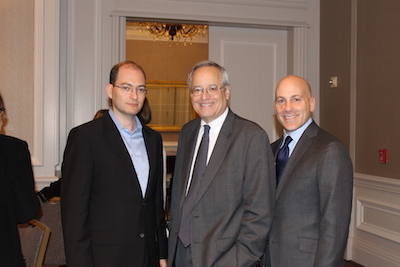 The Forum kicked off with a behind-the-scenes briefing from political analyst Stuart Rothenberg, who shared his views on the current roster of presidential candidates from both sides of the aisle, and why this race is different than previous ones. This was followed by a private White House Policy Briefing at the Executive Office Building at the White House, which has been the scene of many notable events in U.S. history. We were privileged to hear firsthand from Obama Administration officials from the Departments of State and Treasury, who are key players in foreign relations and security. Breaking for lunch at the Top of the Hay, the crown jewel of the historic Hay Adams Hotel with panoramic views of the White House, we had the opportunity to exchange views with Ambassador Dennis Ross on the Iran nuclear deal and the relationship between the U.S. and Israel. Ambassador Ross, who helped shape U.S. foreign policy under five consecutive presidents, was interviewed by journalist Nicholas Lemann. Participants were so absorbed in the interview, you could hear a pin drop when Ross and Lemann talked about how complicated the Iran deal has been, and will likely always be. Lemann is a writer/editor for The New Yorker and former Dean, Columbia University Graduate School of Journalism. 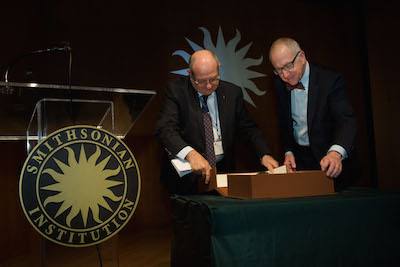 One of the highlights of the Forum was a visit to the Smithsonian National Museum of American History, where Technion President Peretz Lavie presented Smithsonian Institution Secretary David Skorton (former Cornell University President) with the Technion Nano Bible, to be placed in the Dibner Library of the History of Science and Technology. They were joined by Nancy Gwinn, Director of the Smithsonian Libraries; Scott Berrie, Vice President, Board of Trustees, The Russell Berrie Foundation; Technion Professor Uri Sivan, creator of the Nano Bible at the Russell Berrie Nanotechnology Institute; and Brent Dibner, grandson of Bern Dibner, for whom the library is named. Bern immigrated with his family to the U.S. from Ukraine as a child. He studied electrical engineering, fought in a strategic bomber command during World War II, patented electrical power cable inventions, and fell in love with the history of science and technology. Click here to watch the video of the Nano Bible presentation. Shabbat Dinner was particularly fascinating, as we joined President Lavie in dialogue with Dr. Qanta Ahmed, a devout Muslim known for her outspoken stance against radical Islam. Weeks before the horrific attacks in Paris, we examined the global threat of ISIS and other such extremist groups. Dr. Ahmed is Associate Professor of Medicine at the State University of New York, Stony Brook, and an author and journalist. President Lavie and Dr. Ahmed held a session with a similar format at the June 2015 Board of Governors meeting, which can be viewed online by clicking here. As water shortages proliferate around the world, most notably in California, there is no time to lose in the search for solutions. 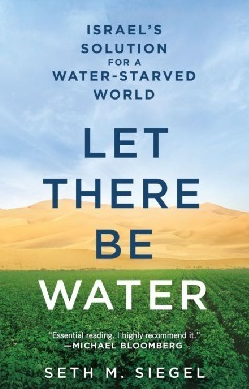 Seth Siegel, author of the just-published book “Let There Be Water,” spoke at our breakfast about the growing divide between water availability and demand, and how Israel can serve as a model for a solution. Many water initiatives have been developed at the Technion. Technion President Lavie gave an insider’s briefing on the Technion and its plans for the future, sharing what keeps him up at night. The current tension in Israel and around the world topped the list. “The Technion can be a model of tolerance for society, a university that puts education as its primary target,” he said. Twelve years ago, the percentage of minority students was just 7 percent with a dropout rate nearly quadruple that of the general student population. After instituting a successful pre-university program for minority students, this population has risen to 20 percent, with a dropout rate on par with the mainstream. “This is co-existence,” he added. President Lavie also talked about the challenge of growing competition and how the Technion has shifted its focus to compete with elite universities outside of Israel, growing its International School, and entering partnerships like the ones in New York and China. Lastly, the President talked about the university’s need to recruit top-notch faculty, and the ATS’s key role in helping the Technion. We then heard from Distinguished Professor and Nobel Laureate Aaron Ciechanover and Professor Ze’ev Ronai, about the exciting new Technion Integrative Cancer Center (TICC), which they co-lead. They were joined by TICC professors Ester Segal and Avi Schroeder. Prof. Ciechanover spoke of the current state of cancer research, and thanked supporters for helping make Technion cancer research what it is today. Prof. Ronai, recruited from Sanford-Burnham-Perbys Discovery Research Institute in La Jolla, CA, talked about the Technion advantage in creating an integrative center—its ability to combine engineering and the basic sciences with medical research and clinical trials. Prof. Segal gave a personal account of her battle with stage-3 breast cancer, and how that led to her current research designing silicon materials to deliver targeted chemotherapy. Prof. Schroeder talked about his work in using nanotechnology to manufacture cancer-fighting drugs inside the body at the tumor site. Click here to watch the video of their panel presentation. Assistant Professor Moran Bercovici, head of the Microfluidic Technologies Laboratory, who developed a "lab on a chip"
We concluded our time together with an celebratory anniversary dinner, held at the Smithsonian’s National Portrait Gallery, which was reserved especially for us. We had a private viewing of the “Twentieth-Century Americans” exhibit while having our own portraits drawn by artists. 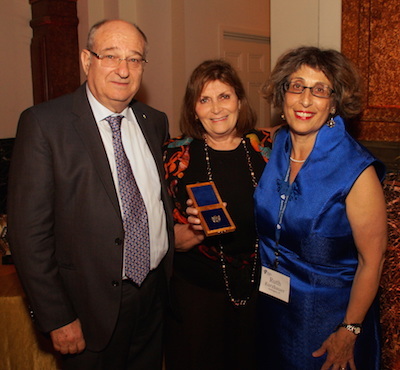 We then honored ATS heroes—the multigenerational ATS families that have helped the Technion become the global leader it is today. Larry Jackier, who served as the master of ceremonies, shared the landmark accomplishments of the ATS over the decades and introduced the 75th Anniversary video, which traces the history of the ATS and how it paralleled the growth of the Technion. Following the video, Janet Shatz Snyder, a graduate of the 21st Century Leadership Development program from Washington, D.C., spoke about her own family’s history of devotion to the organization, and provided an inspirational look to the future. Click here to view photos from the Portrait Gallery event. 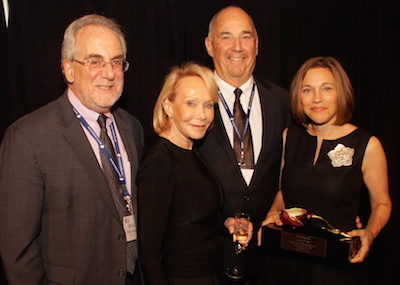 Current and former ATS Presidents paid tribute to Joel S. Rothman for his years of service as ATS National President and Chairman of the Board. 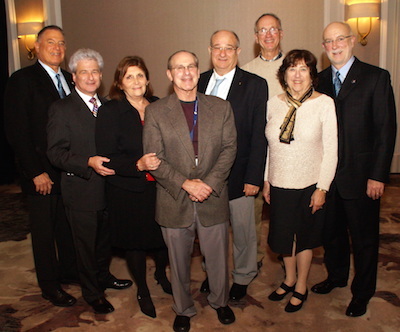 (l to r) Larry Jackier, Joel S. Rothman, Zahava Bar-Nir, Dr. Stephen A. Laser, Technion President Peretz Lavie, Ed Goldberg, Joan Seidel and Scott Leemaster. The Board of Directors meeting, which followed the Presidential Forum, welcomed Zahava Bar-Nir as the new ATS National President, while former President Scott Leemaster became the new Chairman of the Board. At a special dinner, we had the opportunity to thank Joel S. Rothman for his years of service in his local Chicago community, and on the national stage as President and Chairman of the Board. Joel and his wife, Jeri, have selflessly devoted themselves to the ATS and the Technion, including leading Missions to Israel. To recognize Joel and his impact on the organization, a special video tribute was screened. You can view the video by clicking here. We thank Joel for his years of service and his contribution to making the ATS a success.